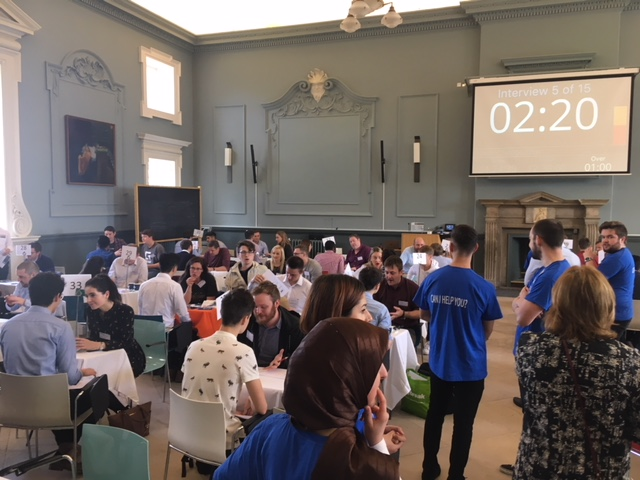 Regent House at TCD came alive on Friday with the annual Computer Science ‘Internship Speed Connect’ event where employers held interviews for internship placements with more than 50 candidates from the Masters in Computer Science (MCS) and the Masters in Computer Engineering (MAI). These placements will run from January to July 2019. The atmosphere was enthusiastic and energetic yet somehow remained ordered as the changeovers took place every 4 minutes and students moved from desk to desk to engage with the employers. The employers were more than happy with the event and for some this was their second outing at ‘Speed Connect’ with many giving full-time job offers to last year’s interns starting in 2019. Speaking at the event, Brian Keane, Head of Engineering at Qualtrics “This is a pipeline which brings fresh perspective, fresh talent and great diversity, a group of students who understand differences in culture, gender, nationality and location, bringing new ideas to build better products for a global company”. Companies attending Internship Speed Connect included: DemonWare, Effective Software, LexisNexis, Bloomberg PolarLake, TechIreland, Qualtrics, Deloitte, Bearing Point, PTC, Workday, Pivotal, Citi, AIB, Hubspot, Guidewire, StarsGroup, Opening.io, TouchTech, Salesforce, Ultan Technologies, Veritas, Mastercard, Hosted Graphite, Arista, SureWash, Groupon, Intel, Accenture, Visible Thread and Ericsson. Many more companies are also offering internships including: APTIV, ASSUREHEDGE, Bank of America Merrill Lynch, Edgescan, KAL, Shutterstock, SIG, Stripe, Travelport Digital and Wia. On a scale of 1 to 10, Hugo De Sousa, Innovation Manager with Bearing Point gives the event a score of 10 saying, “This event is engaging, with high energy and natural conversation between people, great exposure for students. These are high quality students with very impressive CVs who can also communicate, a most important skill”.